The Padua Charitable Fund has helped a new Sibol (under 6 yrs) school by donating hundreds of good books for a new community library at the newly-constructed Airlift Asia multipurpose centre in AAI/GK Eldorado Village. 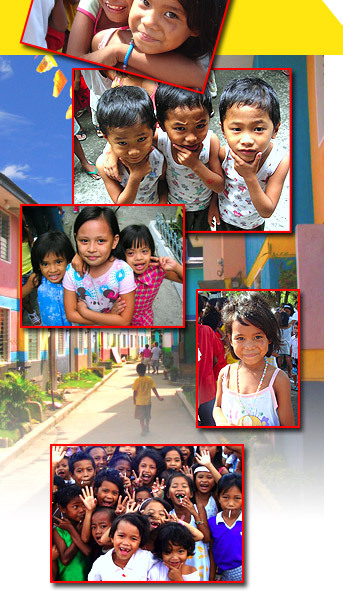 Funds have gone towards a Sibol school. Sibol means "to grow". The new PCF library includes encyclopedias, art books, atlases, children's books, and various reading materials, toys, soft toys and office equipment, including laptops, video camera, CD player and DVDs. The library is proving very useful to both children and adults in the community who feel themselves forunate to be accorded this "luxury". These books (and items such as clothes, shoes, mobile phones, raincoats, school supplies, etc) are sent regularly via "balikbayan" boxes from the UK and the US. A "balikbayan" box (literally "return to one's homeland" box) is a corrugated cardboard box containing any number of small items and sent at low costs from overseas.